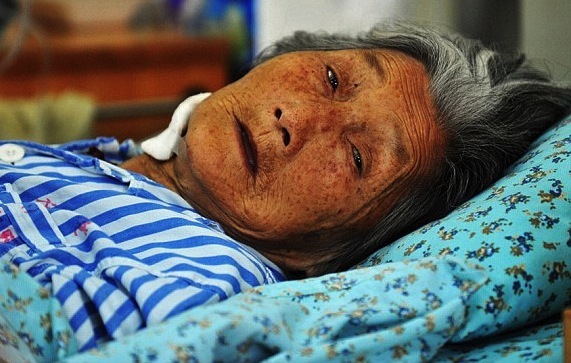 It's been nearly six weeks since her 82-year-old mother died, but Huang Yuan still cringes when she remembers the glimpses she caught of the elderly woman behind the thick glass wall of the intensive care unit. It's a wall that separates, often once and for all, the realm of the living and the immediate, dark corridor leading to the world of death. "My mother had lost the ability to expectorate. So to prevent her from choking on the phlegm building up in her throat, the doctors decided to place her face down," said Huang, taking long, hard pauses between words as she tried to simultaneously recall but also blunt the painful memories. "Mom remained there, her head hanging over the edge of the bed and her forehead supported by a cushioned chair. The combined effects of the illness and gravity had given her a swollen face. It was so bad she could barely open her eyes. Moreover, her lips had been constantly acted on by the same forces, to the point that even when she was temporarily restored to her normal, lying position on the bed, they were fixed in a terrible expression, parted, elongated." The intense suffering was witnessed by the dying woman's seven heartbroken daughters. It sparked a long, often furious, yet ultimately inconclusive, debate among them as to whether their mother was paying too high a price for a chance of recovery so slim that it almost didn't exist. "What did she want - life or relief from the pain? We are still haunted by that question and will be forever," said Huang. "Maybe they didn't have to decide and suffer perennial torment over whatever decision they made," said retired cardiologist Luo Diandian. Luo is now a writer whose own experience of her mother-in-law's death, allied to her exposure to Western medical ideas and practices regarding terminal illnesses, combined to make her a strong advocate of so-called Living Wills. "As the names suggests, a living will is a clear expression of what a person wants and, just as importantly, doesn't want, when it comes to the handling of his or her illness in its very final stage. The core centers on the medical treatment," she said. "For example, a person can specify whether or not he or she will opt for all, or just a certain part of the life-support measures, ranging from being fed by tube and mechanical ventilation, to dialysis and defibrilation." Two things are emphasized when a person is considering making a will of this kind. First, a living will can be changed whenever the testator wishes, with the final version being the last one made while he or she was still capable of doing so, either in written or oral form. Second, for a living will to be officially valid, the testator must be diagnosed with a terminal illness and a clinically estimated life span of less than six months. In addition, the person must not have expressed any wishes to the contrary. In some parts of the United States and Canada, the concept of the living will has become so entrenched that it's now considered a basic human right and is legally protected, according to Luo. Although making a will is not compulsory, people are likely to be advised to seriously consider writing one, once they enter adulthood. So why don't more people embrace this concept and assert control over their exit from the world? The answer is complicated and can be rendered impenetrable by the welter of implications relating to death. Weng Li, an attending physician at Peking Union Medical College Hospital in Beijing, where Wang's mother spent her last days, wrestles with complexities such as this every day. "Unlike their Western counterparts, who are legally obliged to tell the full truth directly to their patients, Chinese doctors seem to be 'bound by sensitivity' to conceal the painful reality from their patients, but instead will tell the family members something closer to the truth," conceded Weng. "It's a cultural issue, but when it comes to writing a living will, the underlying contradiction is: How can you ask someone to seriously consider the option, while making every effort to convince him or her that they are not going to die?" He said that neither the doctors nor the relatives should be blamed. "For the majority of Chinese people, death is still too frightening a thought to face honestly. You might be doing the patient a disservice by plunging them into an ocean of fear where they will simply drown," he said. Huang, whose father died of gastric cardia cancer in 2008, is a believer in "not telling". "When the cancer was first diagnosed, we were told to be prepared for his death within six months, but dad lasted another three and half years," she said. "Throughout that time, we never mentioned it and he never really asked. I had the feeling that he had started to sense the deadline approaching, but that wasn't until the very end of his life. Keep him in the dark, or under the sun? It could be both." In other words, the significance of "the will" notwithstanding, a dying person's often implicitly expressed desire to talk only about survival should be fully respected. And in this case, to be an accomplice in the denial of a hard and imminent truth may be the ultimate demonstration of love, even though it often exacts a tremendous emotional price on those closest to the dying and may deprive both parties of the chance of saying a proper goodbye. In 2006, Luo set up a website, www.xzyzy.com, and started recruiting volunteers to spread her message. But, despite her continuing efforts, she has only managed to have brochures displayed in one private hospital in Beijing. Refusal is often based on the grounds that such a graphic representation of death, often unsparing in its evaluation of each and every treatment and the potential revival measures required, is potentially offensive and may be at variance with a doctor's mission to save lives. "When the odds are overwhelmingly stacked against the patient, and death becomes destiny, a doctor's first priority automatically changes from enabling life to easing its end. It's also the time when the doctor should stop being 'aggressive', take a conscious step back and let the patient decide what's the best for him or her," said Liu Duanqi, a former director of the oncology department at Beijing's General Army Hospital, who spent his working life treating terminal cancer patients. "Sadly, in reality, the majority of patients are dragged by their 'ever-dutiful' doctors all the way through their last, physically and emotionally ravaging journey." There's a tendency to blame the profit motive, because hospitals are often attacked for being driven by financial self-interest, and there's also a fear that some doctors may "persuade" dying patients to undergo harsh, experimental treatment for research purposes, he said. However, according to Liu, the lack of education about death provided to Chinese medical students is at the heart of the problem. "Ask a patient whether he wants to live or not and that person will most definitely say yes. But, if you change the question to whether he is willing to endure this or that in order to live just one more week, you might get a different answer. With all their professional knowledge, empathy and skills, doctors can take a guiding role, even from behind the scenes," said Liu. The reluctance, or possibly inability, of many Chinese doctors to engage patients and their families in sensitive and meaningful discussion about the range of possible choices and potential results often leads to unfounded hope, sudden disillusionment and ultimately anger and despair, according to Liu. "Despite their general feeling of being wronged, these doctors have, in effect, robbed their dying patients of their last opportunity to make sensible, well-informed decisions," he said. "And for people with high-level medical insurance, to prolong the process of death at the taxpayers' expense constitutes, for me, a form of social injustice." The depth of understanding and the courage shown by a person in the face of impending death is the best and most generous parting gift those left behind will ever receive. Chen Zuobing, director of the emergency department at the First Hospital of Zhejiang University in Hangzhou, East China, knows all about that. His father was diagnosed with terminal-stage peritoneal cancer in July, 2011. After a short, yet intense period of wavering that proved all-consuming, Chen helped his 77-year-old father face the stark reality. After deciding against chemotherapy, the elderly man left the hospital where his son worked and returned to his home in the countryside. He planted pumpkins and played with the neighborhood children until his deteriorating health prevented him from doing so. Nine months later, in April, he died quietly at home. "I gave my father the choice and he proved himself a hero," said Chen. While stressing that she puts quality of life above quantity, Luo insisted that there's absolutely nothing wrong if a person decides "not to become reconciled to the idea of mortality, and to fight to the very bitter end". "The idea of a graceful death has always been controversial. To me, the commitment to continued existence, no matter how much pain it entails, requires just as much courage," she said. "The purpose of a living will is to fulfill one's last wishes. Any decision that is truly heartfelt is heroic and fully dignified."